Now that Mr Narendra Modi has become the new prime minister with such a thumping majority , the entire country is very hopeful that India will be able to progress much more rapidly than in the past, as a result of good governance . 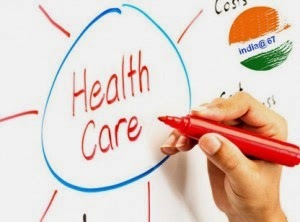 One of the major problems is healthcare , and there is no question that being able to provide high-quality healthcare to over a billion Indians is a big challenge . Indian is a poor country and there just aren't enough doctors to go around . Actually, this challenge is an opportunity, and we need some “out of the box” thinking to fix it. It’s obvious that if we continue doing what has failed to work in the past, we are doomed to continue to fail. It would be foolish to continue this wasteful exercise – and this is a great opportunity to create new solutions, which can provide value for money. This is a wicked problem , and we need to remember that constraints can actually spur creativity and innovation . Indians are great at extracting the last ounce of value, and we can make even a small amount go a long way , because we are so frugal. The trick is to flip the problem on its head , and instead of treating the large number of patients as being a burden, we need to think of ways of using their potential to solve the problem. If patients are the largest untapped healthcare resource, the fact that we have over 1 billion of them is a huge opportunity ! What can we do in order to tap into their creativity , to help them get the best care possible ? For example, in India, every hospitalized patient usually has family members who help to provide nursing care for them. Rather than treat these relatives as unwelcome obstacles, how can we make better use of their skills, so they can reduce the nurse’s workload ? A huge problem today is the poor quality of medical record keeping and documentation . While the Govt is willing to spend thousands of crores in order to fund health care for the millions who live below the poverty line ( for example, through schemes such as the RGJAY, Rajiv Gandhi Jeevandayee Arogya Yojana at https://www.jeevandayee.gov.in/ ) , it’s a very complex task to make sure this money reaches the right hands. It’s well known that the healthcare industry can be extremely corrupt , and because of the huge amount of fraud which riddles it, a lot of the money ends up going to hospitals which lie and steal. For example, many private ( and government hospitals as well) raise claims for performing surgery which was never even done in the first place ! Hospitals fudge records, and it’s hard for the administration to ensure that the government is getting a good return on the money which they are spending on healthcare for the poor. Is it just ending up lining the pockets of corrupt doctors and hospital owners ? The standard approach is a typically bureaucratic one. Once fraud is discovered, the government than treats all doctors as being potentially crooked. They crack the whip by demanding better quality care and accurate documentation ( for example, the doctor now needs to submit a photo of the patient along with the hospital medical record, to prove that care was actually given to them). Over 93% of RGJAY claims submitted by three municipal hospitals , which are run by the government itself , are still pending ! http://indianexpress.com/article/cities/mumbai/93-rgjay-claims-pending-in-three-hospitals/. Honest doctors are very upset with this bureaucratic backlash. They feel they are already overburdened with clinical tasks, and being forced to submit reams of paperwork will just increase their workload and reduce their productivity. They resent the fact that the time and energy which they need to devote to taking care of their patients is being siphoned away in filling out forms. ( I can personally vouch for this. The administrative overheads are a huge burden on the doctor, and we are forced to pass these costs on to our patients, who will be the ultimate sufferers). This is becoming an adversarial situation – which actually represents a huge opportunity. The government can start providing free EMRs (electronic medical records ) using cloud-based computing to all hospitals and doctors. This will make it easy and efficient for doctors to maintain accurate records of all the procedures , treatments and prescriptions which they provide to their patients . This could be a basic bare-bones system , which could even work on their smart phones and tablets . It wouldn't require much of an investment in hardware , because it uses cloud computing . The hospital would not even need to buy computers if they did not want to. The good news is that a lot of clever startups have developed innovative solutions , and hopefully the government of India will use these . Rather than using a top-down approach , and forcing doctors to adopt these technologies , we need to use a bottom-up approach . We should focus on the success stories - the positive deviants. We need to identify the clinics and hospitals which are using these EMRs efficiently to document and deliver high-quality medical care . These doctors are living examples of how technology has helped them to improve their productivity – and they can serve as KOLs ( knowledge opinion leaders) to influence other doctors , and spread the message . These evangelists can help to get other doctors to start adopting EMRs, so that more patients can benefit from it. it would be easy to translate this software and records into local languages. More importantly, patients would then have access to their personal medical records through patient portals . We can then empower patients with information therapy, so that they are confident they are getting the right medical care . It’s sad that we continue to underestimate the ability of patients to heal themselves . Using technology , we can create win-win situations , which will allow India to become a leader in the healthcare space . We have lots of medical expertise and a large number of world class doctors. We are also the IT powerhouse of the world. It’s a question of marrying these two together , so that we can use their collective intelligence and creativity to improve the health of a billion Indians. This can set up a positive virtuous cycle, where better health allows citizens to become even more productive!